Irish was so convinced that this new reactor was a great investment that he bet his career on it. Nearly a decade later, Irish is the CEO of New York City-based Terrestrial Energy, a company that expects to have a molten-salt reactor online before 2030. Terrestrial is far from alone. 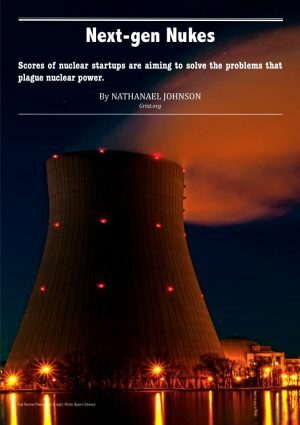 Dozens of nuclear startups are popping up around the country, aiming to solve the well-known problems with nuclear power — radioactive waste, meltdowns, weapons proliferation, and high costs. “It’s like your pot on the stove when you are boiling pasta,” Irish said. No matter how hot your stove, your pasta will never get hotter than 212 degrees Fahrenheit unless the water boils off. Until it’s gone, the water is just circulating and dissipating heat. When you replace water with liquid salt, however, you have to get to 2,500 degrees Fahrenheit before your coolant starts to evaporate.This stuff can sound like science fiction — but it’s real. Russia has been producing electricity from an advanced reactor that burns up radioactive waste since 2016. China has built a “pebble bed” reactor that keeps radioactive elements locked inside cue ball-sized graphite spheres. “In terms of the number of projects, the number of people working on it, and the amount of private financing, there isn’t anything to compare it to unless you go back to the 1960s,” said Ryan Fitzpatrick who works on clean energy for Third Way. Back then, just after Walt Disney released the film “Our Friend the Atom” promoting nuclear energy, when the futuristic notion of electricity “too cheap to meter” seemed plausible, electric utilities had plans to build hundreds of reactors across the United States. Why is this all happening now? After all, scientists have been working on these alternative types of reactors since the beginning of the Cold War, yet they’ve never caught on. The history of advanced reactors is littered with the carcasses of failed attempts. A salt-cooled reactor first ran successfully back in 1954, but the United States opted to specialize in water-cooled reactors and defunded other designs. But something fundamental has changed: Previously, there was no reason for a nuclear company to pony up the billion dollars needed to get a new design through the federal regulatory process because conventional reactors were profitable. That’s not true anymore. Similar stories have played out abroad. In Finland, construction of a new reactor at the Olkiluoto power plant is eight years behind schedule and $6.5 billion over budget. In response, these nuclear startups are designing their businesses to avoid horrible cost overruns. Many have plans to build standardized reactor parts in a factory, then put them together like Legos at the construction site. “If you can move construction to the factory you can drive costs down significantly,” Parsons said. Matthew Bunn, a nuclear expert at Harvard, said that if nuclear power is going to play a role in fighting climate change, these advanced nuclear companies will have to scale up insanely fast. “To supply a tenth of the clean energy we need by 2050, we have to add 30 gigawatts to the grid every year,” he said. That means the world would have to build 10 times as much nuclear power as it was before the Fukushima disaster in 2011. Is that even realistic? “I think we ought to be trying — I’m not optimistic,” Bunn said, noting that the pace at which we’d need to build solar and wind to quit fossil fuels is just as daunting. Big barriers remain in the way of a nuclear renaissance. It takes years to test prototypes and get approval from federal regulators before a company can even start construction. “In order for advanced nuclear technologies to play a role in deep decarbonization over the next several decades,” the United States would need to overhaul the way it’s rolling out the technology, according to a study published earlier this month in the Proceedings of the National Academy of Sciences. Experts point to many of the same steps to give advanced nuclear a fighting chance: Making regulations more friendly to innovation, instead of favoring conventional reactors. Creating incentives to reward utilities for buying low-carbon power. And a lot more funding. The people behind the new crop of nuclear companies think they can get to market much faster with the right help. Oklo is shooting to have a commercial reactor online before 2025. “Can we decarbonize quickly with nuclear? France did it, it can be done,” Cochran from Oklo said. “Our reactors are 500 times smaller than the [latest conventional reactors], they have all these inherent safety characteristics, and they can consume nuclear waste. Will our application process be any shorter?”. At this point in history, everything is a longshot. We’ve got to completely replace our energy system on the fly. To do that, people are planting a lot of different seeds. It’s still a long time until harvest, but we’re seeing a flush of new sprouts from the advanced nuclear section of the garden. This new flush of nuclear possibility has excited young people who see nuclear as a way to shift away from fossil fuels. College students are gravitating toward nuclear engineering. The number of students studying the subject cratered when the nuclear industry collapsed in the late 1970s (the Three Mile Island accident in 1979 didn’t help), but it has been creeping steadily higher since the early 2000s. Some of those students are going on to start their own advanced nuclear companies. David Schumacher, a documentary filmmaker, met some of these young people and became so infected with their enthusiasm that he made a documentary about them, The New Fire, which came out last year. While Terrestrial battles public opinion, Irish said his company has been hitting every milestone on time. Canadian regulators announced last year that Terrestrial had completed the initial stage of its design review — the first step toward approval in that country. Irish has already selected sites in Ontario where Terrestrial could build the first reactors. Although Irish was mum on Terrestrial’s other milestones, he did describe an experience that he said gives him more confidence in the company’s prospects than any of its other accomplishments so far. At Grist, you can find find reasons for hope and optimism every day — while also irritating and shaming those who stand in the way of progress. The independent, nonprofit newsroom pursues in-depth stories on under-covered topics like clean energy, sustainable food, livable cities, environmental justice, and a better economy. 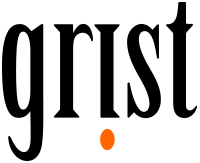 Grist elevate solutions, expose inequity, and give the readers the context, knowledge, and tools to make a difference.